Yesterday served as a textbook example of how not to conduct an early stage knock-out game against a supposedly much inferior team. Palmeiras ”held knife and cheese in hands”, as one would say in Brazil, but did not accelerate at the right moments, allowing Comercial to breath and create the occasional change of scoring. During one of those, they found their goal with a nice header, determining the final result with 15 minutes left of the game: 1-2. Valuable time that could have been invested in rest and training, Palmeiras now have to deploy in preparing for the return game coming Wednesday, when Comercial will play the game of their lives in São Paulo. Even if Comercial is kicked out of the Brazilian Cup on Wednesday (and anything else would be a huge sensation), the fact that they were able to provoke a second leg is tremendous good news for the small team from Piauí. A return game in São Paulo means that all revenues from this first bout – roughly US$ 150.000 – go directly to Comercial. That sum equals six months worth of player salaries for Comercial. And they deserve every cent. Comercial fought hard and fair, honouring their jersey the best way they could. The Piauí side did also get lucky, one must admit. On several occasions the ball could just as well have gone all the way to the back of the net. Also, there were two gross referee errors in Comercial’s favour: one clear penalty on Kleber and one goal by Adriano deemed offside (watch the highlights below). 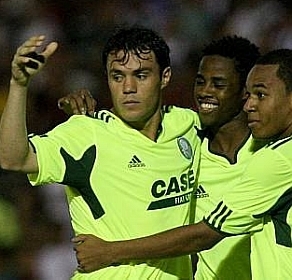 But let’s face it: Palmeiras blew it. The team did not come together as it should have. Valdivia played very well and Kleber fought hard as always. Adriano showed talent. Cicinho had good moments in the first half. But that was about it. With 0-2 and halfway through the second half, Scolari substituted Valdivia for defensive midfielder Chico, killing most of Palmeiras’ creativity. When Comercial scored, the change of gear simply didn’t happen. And perhaps that is the most worrying part of yesterday’s display: the apathy of our players. And also very modest commemorations after the two goals. Is this just something momentary, or are darker clouds gathering on the horizon? Felipão better get this sorted out quickly: on Sunday, SPFC awaits. I wish we could get back Diego Souza. Felipao shouldn’t have played it so defensive and surrender the midfield to Comercial when we were up 2-0. Leivinha, peronally I hope that Diego Souza stays far away from Palmeiras. He’s a good player, when he wants to. Problem is, he rarely does. His last months at Palmeiras were tricky. His months at Atlético Mineira have been a disaster. And now he’s going to Vasco… I might be wrong, but I don’t think it will do Vasco much good. I see him as a bit of a bad influence on other players. Let’s see, time will tell. Have a good weeekend and da-lhe porco!